Denver thrashers HAVOK today announce their first headlining tour of South America. Dates are set to commence March 28th and will see the band journey south, cris crossing the great continent of South America with a first and final stop in Brazil. 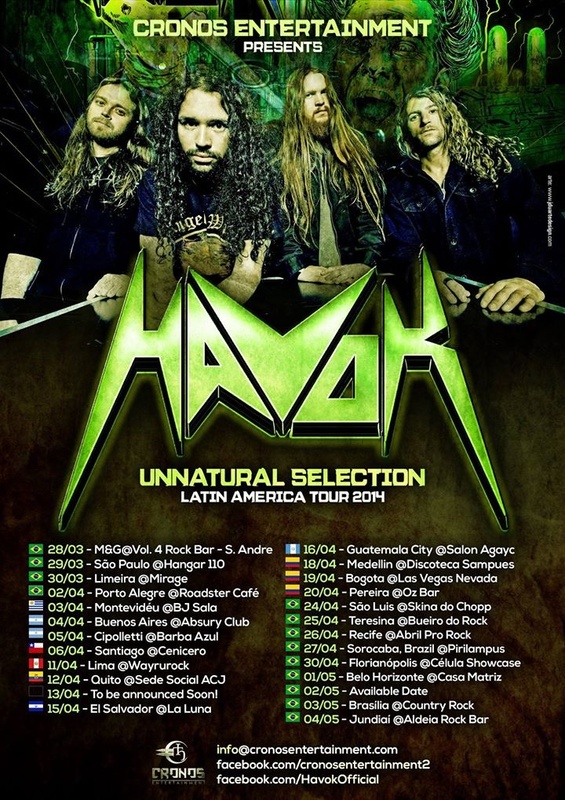 Havok has been touring the world in support of the band’s latest album, Unnatural Selection. Unnatural Selection, the band’s third full-length album for Candlelight Records, was produced by guitarist David Sanchez and mixed by Terry Date (Pantera, Overkill, Deftones). The album features original artwork from Polish illustrator Rafal Wechterowicz (Slayer, Mastodon) and was mastered by James Murphy (Testament, Death,Lazarus AD). For a full list of dates visit the band’s official Facebook Here. HAVOK, called “the finest thrash band in existence” by PopDose, released their full-length debut, Burn, in 2009. Time Is Up would follow in 2011. “HAVOK have hit their stride,” said Decibel Magazine. “HAVOK is everything that is great about thrash,” added Terrorizer. Confirmed HAVOK dates at press time are included below. 04/13 – To be announced Soon!